Sure it’s nice to stay in the middle of it all and get a “taste” of everything Gatlinburg has to offer, but one truly does not soak in the entire experience unless you venture inside the National Park and check out number two on my list. There are dozens of waterfalls and cascades within the National Park boundary; each of them with its own features and setting that stands apart from the others. I will focus on two such phenomenal creations that we have been privileged to have seen up close. We decided to take our son to see Grotto for the first time this year, since we already knew what to expect seeing it previously without him, so we thought he would enjoy it as much as we did. 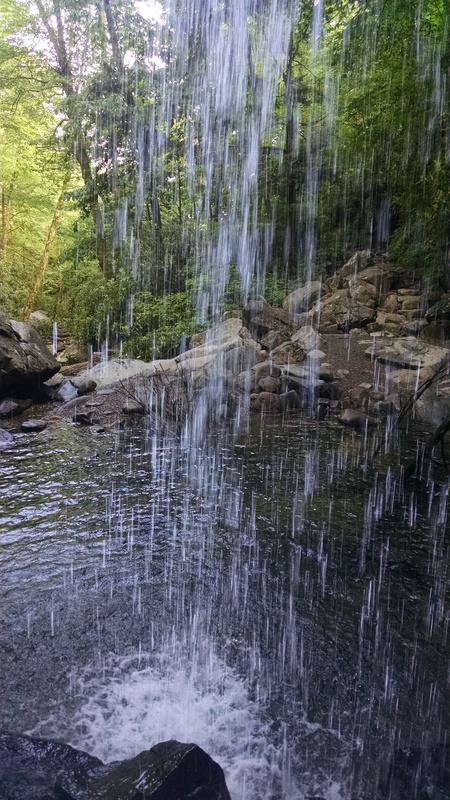 Grotto Falls is located off of the Roaring Fork Nature Trail, which is a 5.5 mile one-way drive that takes you past homesteads, hiking trails, and tons of scenery that begs visitors to take loads of photos. Grotto Falls is a relatively easy trek located on the Trillium Gap Trail. 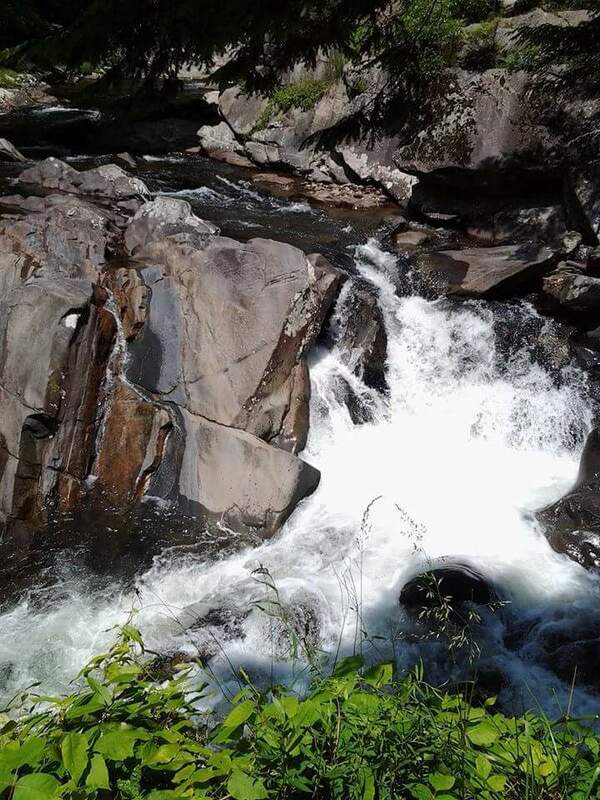 It is 1.3 miles to the Falls, but most of the hike is a steady uphill climb that can be a bit challenging for the novice. The payoff is getting there and having the opportunity to walk behind the Falls, which makes for some unexpected fun, since you are guaranteed to at least have a thin mist of water hit your clothing. We were a bit disappointed the Falls wasn’t as wet the second time, but that didn’t at all take away from the experience. Overall, it’s an excellent hiking choice, and a popular one, especially with children. We visited this impresssive cascade last year, even though we weren’t sure what we had come across. This cascade is a roadside falls, but it has a parking area, due to the size and volume of water that flows through it. It is located off Little River Road, which is the same road that connects the Sugarlands Visitors Center to the specatacular Cades Cove. This is a somewhat popular cascade to visit, but it can be a bit dangerous since there are dropoffs, and there are a few ledges below the main viewing location that can be, but maybe shouldn’t be accessed. Still, this may be the most impressive cascade in the park, as many of the others are just pulloffs that are quiet streams, but those same ones can be ideal for family photographs or just standing and admiring nature in its most serene state. Words fail to express what one experiences when in these environments where life slows to a crawl. Take it in if you don’t get the opportunity often. This concludes part four of my great things series. I hope you will stick around to find out my greatest thing about Gatlinburg. You shouldn’t have to think too long to guess what is number one on the list.